You can listen to the orchestral work Lyra on his website. Apparently inspired by Beethoven's 4th piano concerto and the mythology of the lyre as originary to the Western musical tradition, the work begins with a G major chord played on a harp and develops fairly quickly into a expansive, gently mysterious orchestral poem. It sounds a little bit like the soundtrack to a science fiction movie with cartoon spaceships that bump into each other. Cheung's compositions are highly cultivated. Many of them have heavily theoretical explanations or starting points. Cheung composes very good titles. The influence of jazz melody and improvisation is clearly evident. What one might call the melodic line of a given piece is usually consciously inverted into anti-melodies. Sometimes he will tease something in a coherent tonality and then intentionally upset it with an unexpected effect or other intrusion. He incorporates prerecorded sound and other electronic devices relatively frequently. His use of electronics is often said to be "seamless," as opposed to gimmicky. He has a tendency to use either very long single tones or quick textural or percussive clusters such as short scales or Messiaenic "birdsong." Harmonically, Cheung's compositions tend to "feel" major. There is audio of 20 works available for free on his website. Many of the links are shorter samples. From Youtube, I've found the following pieces to be representative of his style and approach: Vis-a-Vis, chamber work for 18 musicians of the Linea Ensemble from 2011. The opening movement is a bouncy grosso in an odd time signature with a very prominent plucked bassline. The second is chaotic and multi-layered, with no underlying pulse and heavier use of percussion. The work slows down after that into more of a softer, sliding dirge before picking up towards the end with thicker layering of divergent textures. There is some kind of device being utilized in sections that sounds like it is recording and filtering what is being played and then replaying it. Fog Mobiles, a concerto for French Horn from 2010, as far as I can tell a single movement. Moderate tempo throughout, the horn part displays Cheung's jazz sensibilities. It sounds like it is worried about something but can't figure out what it is. There is an orchestral part in the middle that sounds like Ligeti from the movie 2001. Finally, Improvisation after Ellington's "Prelude to a Kiss." Cheung on the piano from 2012. Don't know if this is really an improvisation, but there is real feeling here. How do you place or conceptualize these seemingly disparate influences? American, European? I think we’re in an exciting time where so many of the sonic characteristics that once connoted acceptance within a clearly defined aesthetic have been lifted, recontextualized, and re-invented, and that there isn’t a taboo surrounding their re-appropriation. Of course there is still the matter of being inventive and in good taste about it, but the fact that it’s harder to point to unified schools of thought based on nationality or region is definitely a healthy thing. But Chris Trapani’s question posed at the end of his interview is an important one to consider: can there be a regional voice for the American composer? I would like to think that regional influences can and should be tapped into, without necessarily being the primary defining characteristic of a composer’s output. And the important question is whether there is something musically interesting and relevant about putting these things in dialogue with one another. I also think there’s quite a lot to be explored in terms of the consonance (or dissonance) of very distinct cultural references suddenly being thrown together. One of the ways I go about it in this piece is through live-processing of the piano. The piano, the exemplar of equal-temperament in western music, sometimes get processed through an “auto-tune” filter, using modes from different traditions and historical periods, such as just intonation and Indonesian gamelan tunings. Just as field recordings from very different cultural contexts get mixed together, so too do the tuning practices of cultures vastly removed by time and place. There is a lot in this response. First, he is saying that genres--and nationality or even race as a "genre"--no longer mean what they used to, and he is the beneficiary of this progressive situation. This is a very politically-correct response. It is true in a lot of ways, but it is also a simplification. In the first half of the first paragraph, the subtext is that he is deconstructing any expectation of regional identity from himself (as well as arguing for the authenticity of an outsider's reappropriation), but in the second half he restores legitimacy to the regional identity of the American. This reminds me a little bit of M. Night Shyamalan casting white actors for the Asian roles in The Last Airbender, and then responding to the controversy by claiming that the film is a "multicultural tentpole" and is progressive for giving him, an Indian-American, wider control over casting than any other "Asian" filmmaker has had in the US. To me, Cheung is juggling his role as a participant in the creation of culture in the West. He is a pure example of one possible path, and it will be interesting to see where that path leads. In some ways what he is really arguing for above is artistic individualism. This brings up a whole hornet's nest of questions about the meaning of art, about where meaning comes from in art. Is art a "technology," something anyone can master and move forward, regardless of race or nationality, based on his or her innate ability, or is art primarily social, the exertion of influence of a people or a culture? If Cheung advances the art of music production in the West by mastering not only its forms but also its ideology, arguably at the expense of his own identity, does it mean anything? Review of a work by Cheung that recently debuted in New York. A violin sonata that Jennifer Koh asked Cheung to contribute to her Bridge to Beethoven project. I have been gathering material for an entry on Jennifer Koh, but have not had the time to write it. I will look for video of this work and try to review it. When the violinist Jennifer Koh asked Anthony Cheung to write a piece for her, responding to Beethoven, he happened to be already working on “Lyra,” a commission from the New York Philharmonic partly inspired by that composer’s Fourth Piano Concerto. But he took on Ms. Koh’s assignment, too, and on Monday she and the pianist Shai Wosner gave the New York premiere of Mr. Cheung’s “Elective Memory” in Buttenwieser Hall, an intimate space at the 92nd Street Y, ideal for chamber music. The concert was the third in Bridge to Beethoven, these players’ series pairing Beethoven’s violin sonatas with new works exploring his influence. The program opened with Beethoven’s Violin Sonata No. 3 in E flat (Op. 12, No. 3) and ended with Beethoven’s last work in the genre, the Sonata No. 10 in G (Op. 96). 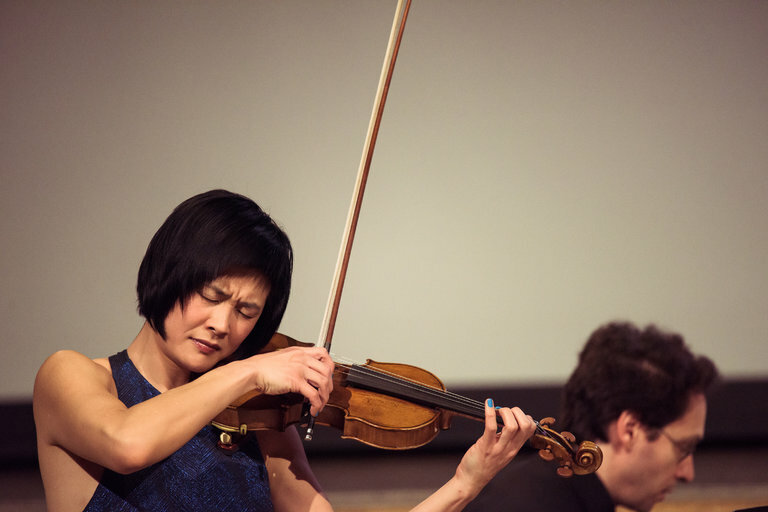 In between, Ms. Koh and Mr. Wosner played “Elective Memory,” a duo in three movements, lasting about 18 minutes, written as a response to that final Beethoven violin sonata. Hints of Beethoven’s Sonata in G permeate Mr. Cheung’s piece. The first movement, “Aubade, for a Golden Age,” begins with a hazy recollection of Beethoven’s strange opening theme, which is really just a motif, a “birdcall trill,” as Mr. Cheung aptly describes it in a program note. That element and others are put through what sounds like a process of cosmic rumination. Faintly wailing violin lines interact with oscillating intervals and murky chords in the piano. The musical language combines atonal and tonal aspects into lush, mystical sonorities. At one point, the music turns frantic, a shift subtly signaled during the quizzical opening. “Broken Scherzo: Tripping Up, Falling Down,” the second movement, is even more jumpy and fragmented, with skittish bursts that suggest both jazzy improvisation and ethereal Messiaen. The third movement, “Nocturne, Half-Remembered,” returns to the elusive world of the first section, but with more pronounced lyricism. Ms. Koh and Mr. Wosner played the piece beautifully, though it might have been more helpful to hear it after the sonata that inspired it, which was given an eloquent performance here. The scintillating account of the feisty Beethoven sonata that opened the program was also especially enjoyable.